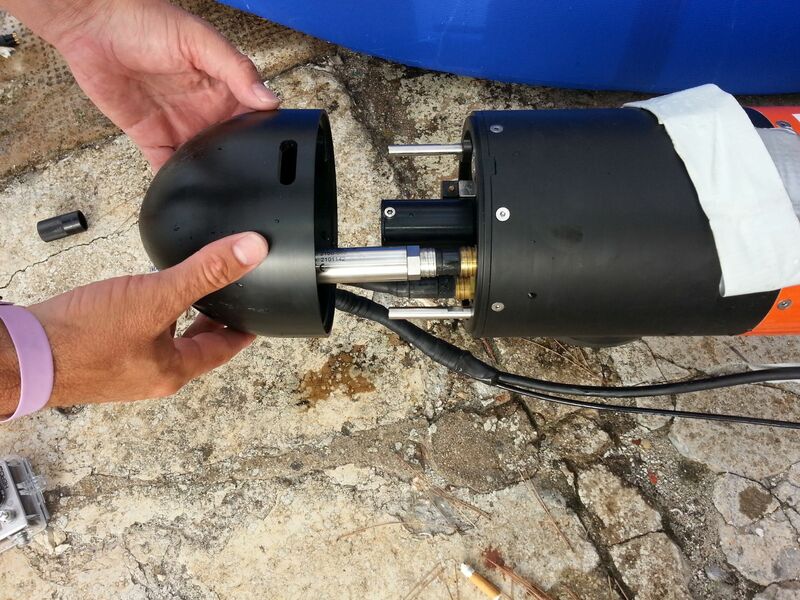 A new nose has been design by the Universidad Politécnica de Cartagena to integrate the Turner Cyclops Integrator in the IVER2 AUV. 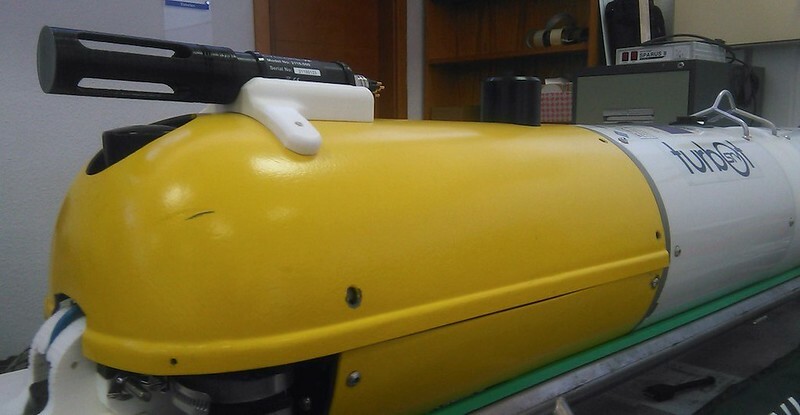 This design imply to add a second CPU to the AUV to be in charge of recording the Oil and Rhodamine data provided by the probe and merge them with the navigation data from the vehicle. 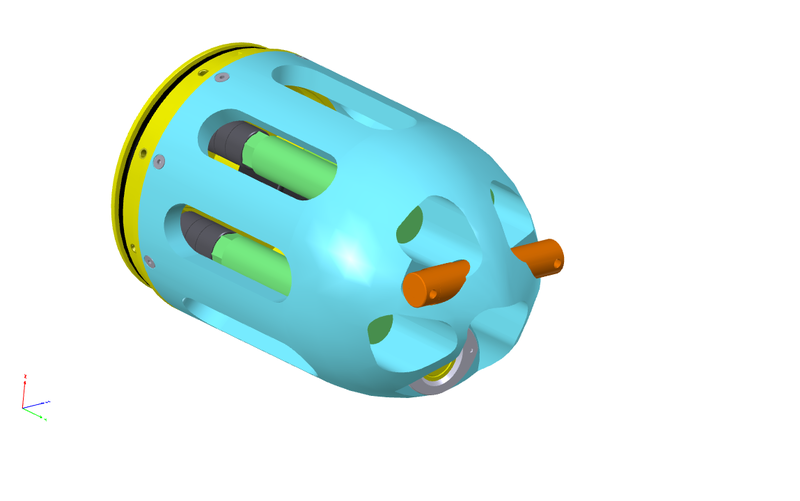 To integrate the Cyclops probes, OceanScan has designed a new nose section for the LAUV that can accommodate sensors from different manufacturers. 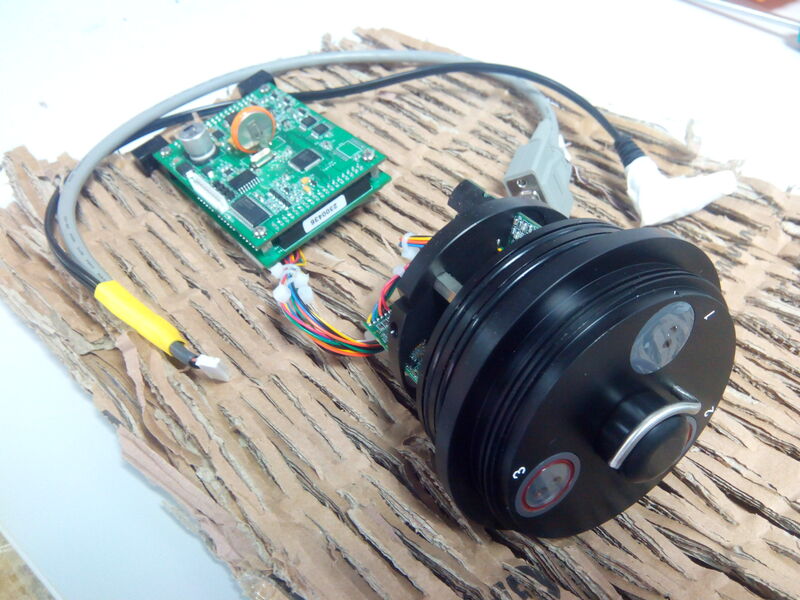 Besides the probes for Refined Oil, Crude Oil and Rhodamine, we can also integrate dissolved oxygen, sound velocity sensor, pH, and the section also includes a forward looking sonar. The electronics board that interfaces with the sensors is based in AML’s Metrec-X, that includes multiple analog input slots, to which the Cyclops C7 probes will be connected. This isn’t the final solution yet and may suffer modifications. The sensor configuration in the images serves just as an example. From the hardware point of view: wet connector is installed between flooded nose (wet side) and DVL compartment (dry area). C7 Probe can be installed and connected directly on the connector as shown on the images or can be connected using extension cable, so the probe itself can be positioned anywhere on the vehicle. On the dry side, probe is powered by 12VDC from the AUV power distribution board and probe signal output (analog output) and range inputs are connected to the backseat PC. From the software point of view, backseat samples the probe measurement and automatically adjust the probe range. At the same time collects the position data from the front seat and internally log all this data together. In case of near real time data transfer, backseat communicate via MicronNav modem with the surface transducer and handles the transfer. 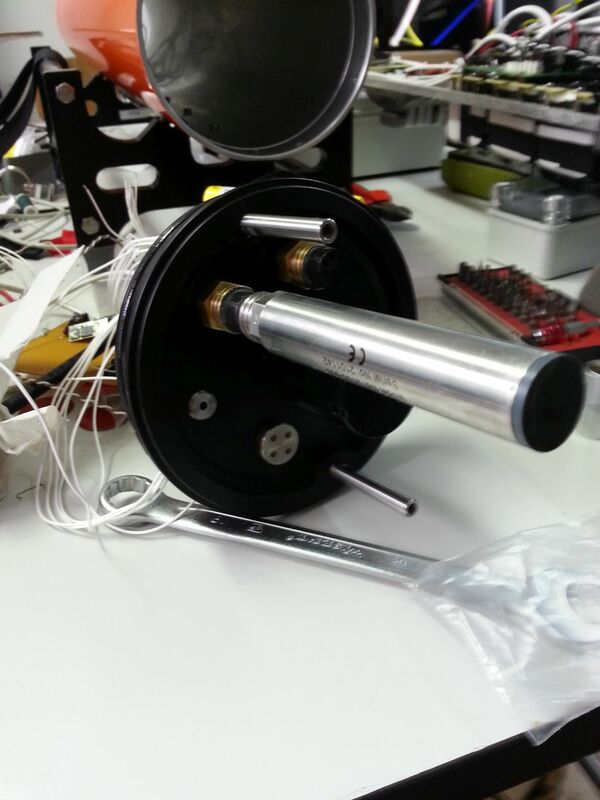 The UIB and UdG laboratories have adapted the vehicle to accommodate the Cyclops C7 fluorometer probe without any irreversible change. The sensor is attached to the vehicle’s structure on the payload area using a specially designed holder. 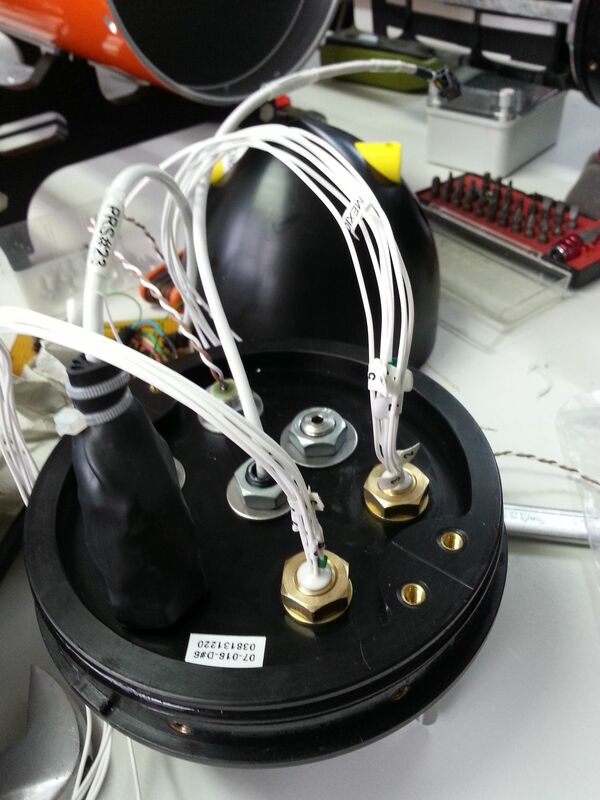 The probe is powered with 5VDC from the AUV. The analog data and control lines are digitalized and serialized thanks to a dedicated microcontroller board and sent to one of the vehicle computers. The rhodamine sensor readings are periodically gathered, time-stamped and stored with all the corresponding navigation data so they can be accessed by a base station in navigation time or downloaded at the end of the mission. 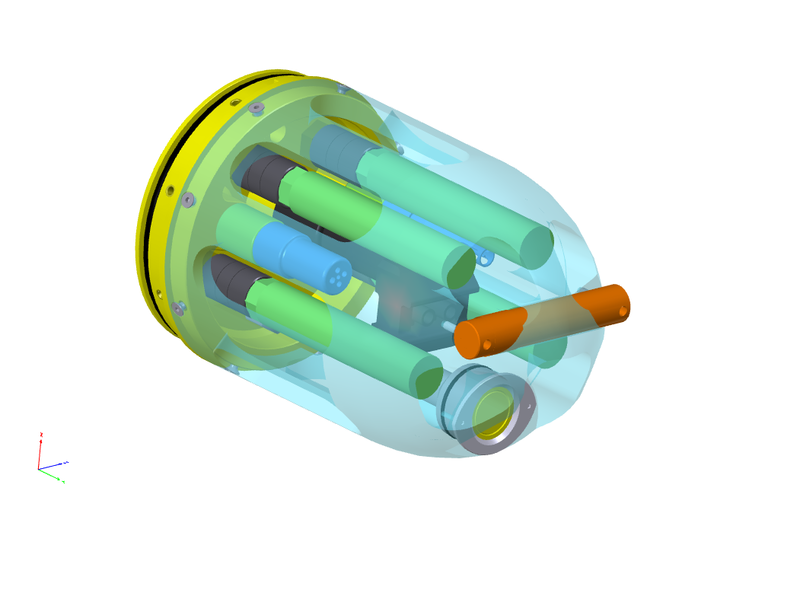 Both Sparus and Turbot are equipped with an USBL transponder/modem and can be accessed from a base station while they are underwater. Once on surface, a Wi-Fi link is available. A single Rhodamine sensor (plastic housing & shade cap) has been integrated with a simple temperature sensor. The sensor needs to be positioned in a place where it is safe during deployment and recovery. We chose top of the vehicle, streamlined with the handle. Potted the cable penetration with Scotchcast 2131 resin. The Cyclops 7F optical sensors output an analog signal. If the AUV has an integrated analog digital converter, it is just another input and connection to the 12V DC supply power. In our case we integrated a Cyclops Explorer into the vehicle (connection via USB).